To support our modern lifestyles, we need farmers. Most of us are very aware of that dependency. But what if I told you that farmers are endangered? Our image of the hard-working farmer who rises before the sun, devoted to the land he plows and driven by the mouths his harvest feeds is already a rarity. In today’s industrial agricultural system, most decision-makers of farms are actually businessmen who focus on buying and selling products and know very little about the land. Even those who do work the land sit in the temperature-controlled cab of a machine, dropping its steel claws into the soil, tearing fruit from the stalks, and spraying fertilizers. The same industrializing force that diminished crop diversity also shrunk human contact with the land. The world today loves technological advancement, identifying it as the thing that put access to Google and distant loved ones in our pockets. Technology dependence in agriculture can become problematic, however, when use of technology detaches farmers from their land. Industrial agriculture requires fewer humans to operate at the cost of constant genetic modification, application of expensive inputs, and crops vulnerable to wipeout from a single pest or disease. Although technology use in industrial agriculture has increased immediate productivity, it has sacrificed the sustainability, equitability, stability, and overall productivity of the agricultural system. The organic farmer, however, avoids all of this simply by knowing his land. His farm does not depend on agrochemical inputs, but instead thrives in sun, rain, and healthy soil. The species on his farm are strong enough to resist local pests and diseases. Because he understands natural processes and ecological relationships, he is able to work and manipulate parts of his land to synergistically produce more food, at a higher quality, more sustainably. At Berry College, students are shaped toward excellence in three areas, determined by the college founder, Martha Berry: head, heart, and hands. This means not only academic advancement, but also character development, and passion. The students who study hard in Berry College classes also mow the lawns, milk the cattle, cook the meals, and more. They passionately pursue their goals, and understand that only hard work and personal dedication will lead to productivity. So, too, does the sustainable farmer. His farm produces because he knows his land. His head, heart, and hands are intimately involved in every aspect of production of it. He may use a machine, but he understands what, why, and how it is used. 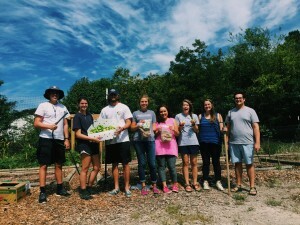 Through the ABC Project at Berry College, we are seeking to create and support the future of sustainable farming. This is achieved by working with students to practice traditional farming methods, learn from farming communities, and support the continuation of such practices.